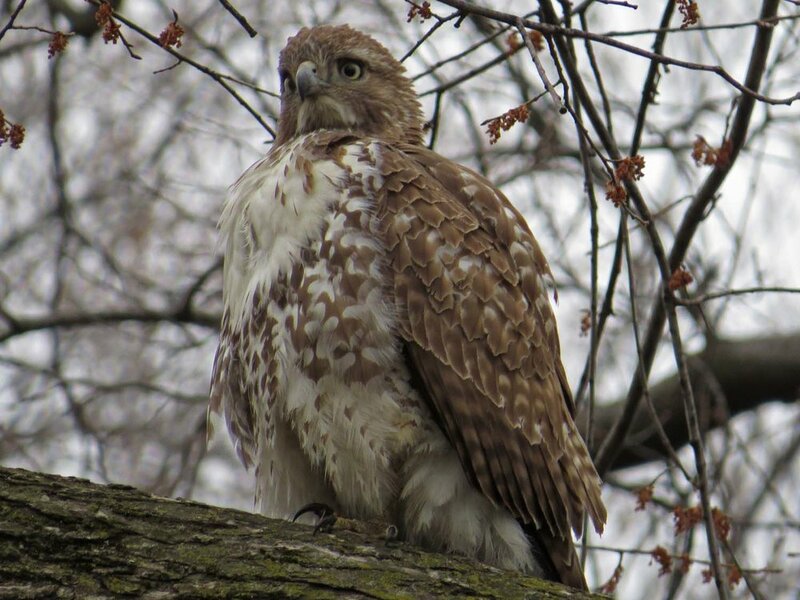 Two first-year red-tailed hawks brunched in the northwest part of Central Park on Sunday afternoon, March 26. They didn't dine together, one finding pigeon on a tree branch to his liking, and the other seeking squirrel on terra firma to satisfy her cravings. The first hawk had no trouble supping in a tree, but the second hawk had a few more problems finding a suitable dining spot to eat uninterrupted. This kid had chased squirrels for a while, then flew over to Central Park West to look for pigeons (and maybe a condo), before returning to the park, finally catching a squirrel just west of the tennis courts. The squirrel was too heavy to lift into a tree, so the youngster had to find a way to eat it on the ground, while watching for potential dinner thieves among the hawks flying overhead and the people and dogs walking and running by. The video, Separate Tables, was a challenge to film because it was difficult to keep the camera rolling while yelling at people to keep their distance from the hawk. 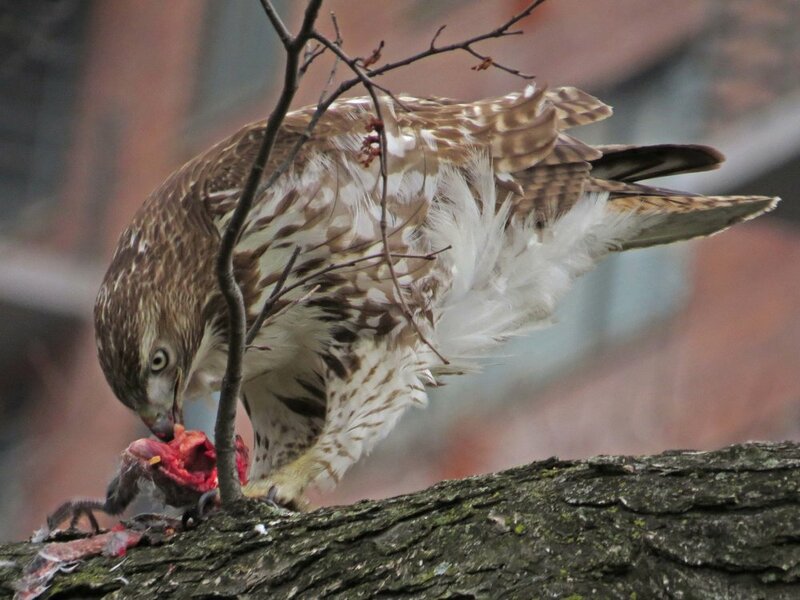 This set of photos shows the first hawk with his tasty pigeon. The second hawk, after chasing squirrels in the park and hunting pigeons on Central Park West, finally caught a squirrel just west of the tennis courts, but couldn't lift it to a tree, so thought it a great idea to stand on the squirrel, mantling it from possible thieves, head feathers on end, for quite some time before beginning the meal. The hawk and the squirrel remained on the ground for more than two and a half hours, before an off-leash dog chased the youngster into a nearby tree, where the kid contemplated the wisdom of retrieving the rest of the meal.